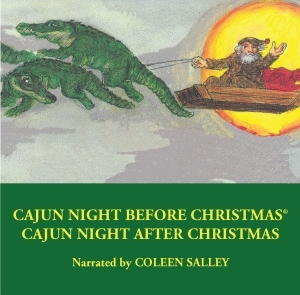 Master storyteller Coleen Salley narrates two timeless family Christmas stories, capturing the unique sounds of the bayou as a backdrop for these holiday tales. 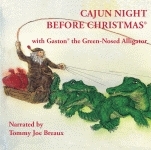 The first story, Cajun Night Before Christmas®, is the Cajun version of the Clement C. Moore classic. It’s Christmastime on the bayou. The fiddler, accordion player, and the rest of the band are hammering out their Cajun/French-style “We Wish You a Merry Christmas” when suddenly they see something blazing across the sky. Who could it be? Why, Santa Claus, of course, flying high on his skiff pulled by eight friendly alligators! Gaston, Pierre, Suzette, and the rest give Rudolph and his gang a run for their money as they deliver “St. Nicklus” to his Christmas visits. In the second story, Ms. Salley tells what happens next. Cajun Night After Christmas is a story about what happens to St. Nick, an alligator named Pierre, and the Boudreau family once the holiday is over. Boudreau rescues Pierre and brings him back to the house as a pet. Before Pierre has a chance to escape, a cute girl alligator makes eyes at him. When the two fall in love over a bowl of good gumbo, Pierre decides to raise a family. St. Nick visits the family every year to bring gifts for the children and spread some good cheer! This delightful compact disk, the perfect read-along gift for any child, will add a special Southern warmth to your home during the holidays. As children’s author, storyteller, and professor emeritus of education at the University of New Orleans, where she taught for thirty years, Ms. Salley inspired countless future teachers, writers, and illustrators. The author of Pelican’s Who’s That Tripping Over My Bridge?, Ms. Salley passed away in 2008 at the age of seventy-nine.